This is the sunshine coast page. A Half day tour exploring the beautiful Mary River valley in the Sunshine Coast Hinterland and enjoying a journey on the historic "Valley Rattler" steam train. Explore Fraser Island on a two day 4WD adventure. Departing from Brisbane we visit the amazing sands of Rainbow Beach and then onto Fraser Island. Here you'll discover lush rainforests, crystal clear lakes and stunning beaches. Enjoy your time swimming, sunbathing and simply relaxing! Our hands-on cooking classes are more than a cooking lesson. In addition to preparing a sumptuous meal, you will learn the elements of entertaining in a relaxed and fun environment. Class sizes are limited to 6, allowing ample opportunity for everyone to participate. Australia Zoo on the beautiful Sunshine Coast, Queensland, is home to over 1,000 native and exotic species that can't wait to get up close and personal to you! Check out the 14 FREE wildlife shows featuring a stack of slithering, swooping, jaw-snapping action. A cruise on Steve's Whale One will be nothing short of an adventure! On board, guests can take in the 360 degree views from large observation decks, and whale sightings are guaranteed. There's onboard marine education and to whet your appetite, there's a delicious smorgasbord lunch! Cycling from the mountains to the sea lets you experience the amazing scenery of Queensland sunshine coast that you won't see from a car window. If you want to have a lot of fun with a sense of achievement then this cycling tour is a must do. This half day tour takes a scenic drive to the Sunshine Coast hinterland to Flame Hill Vineyard Cellar Door for wine tasting & enjoy lunch on the veranda (lunch at own expense) then have 1 hour free time in Montville, the Maleny Cheese factory & a scenic drive past the Glasshouse Mountains. A vist to the World famous outdoor markets in the historic hinterland town of Eumundi are an absolute "Must Do" on your visit to the Sunshine Coast. Taking a flying lesson over Caloundra! This complete half hour introductory flight lets you take control of the Texan TC550, a super sporty light aircraft. With superb visibility and comfort, your views will stretch right down the coast to the hinterland down to an awesome 500ft low level rush! Ever wanted to run away with the circus? Come and try your hand at all things trapeze. If swinging from a trapeze rig sounds like fun, then you've come to the right place. Enjoy 90 minutes of pure adrenalin swinging fun with personal tuition from your experienced instructor! Jump aboard one of our brand new Warrior 4WD vehicles and experience a great value tour of World Heritage Listed Fraser Island. We are committed to giving you the very best Fraser Island experience in one day. Give us a day....we'll give you memories for life! Departing regularly from Brisbane and the Gold Coast, we offer an exciting range of guided day and overnight tours. We are a collection of Eco-guides who have a passion for our natural treasurers and a wealth of knowledge to pass onto our guests. This trip has it all - a fun ride on a custom built trike as well as a rollicking journey on a wonderful old train through the beautiful Mary Valley. Take in the magical views of the Sunshine Coast hinterland and Glasshouse Mountains from back of a roaring trike. Experience a 75 minute flight in a glider, high above the picturesque landscape of the Sunshine Coast! View unspoilt beaches and the stunning hinterland and all without a motor. Experience the beauty of silent flight and take in the views! 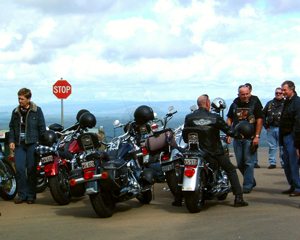 Experience the thrill of a ride on a Harley as you climb up the Blackall Range and the exhilarating ride back down again. There's something about a Harley. The mystique sets it apart from anything else on the road. It's a bit of a mystery and hard to explain but mostly it just feels good. 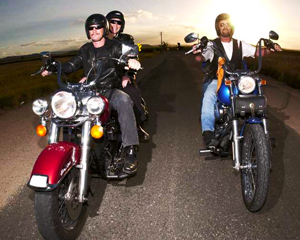 Grab a friend and go on a pub crawl with a difference, riding between pubs on the Sunshine Coast in the comfort of a Harley Davidson three-seater Trike. The roar of the Harley Davidson Trike mingled with the cosiness of country pubs will make this pub crawl a unique and memorable experience. Escape the stress of modern day life and let your personal chauffeur take good care of you. Sit back, relax and enjoy the ride on an eye catching custom built Harley-Davidson trike as you head off to one of the coasts fine wineries to enjoy tasting a drop of wine or two. This twilight 1.5hr Harley Davidson tour will see you roar down Sunshine Coast roads on this totally flexible ride, where you choose the destination and route. Sheer enjoyment! 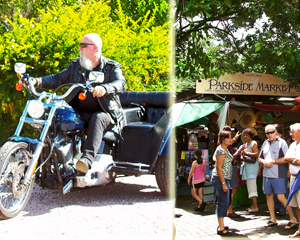 This is an awesome one hour one way scenic tour to or from the Eumundi Markets, with a twist...you're traveling on the back of an awesome Harley Trike! On your 60 minute chaffeur-driven Harley Davidson ride, you will thunder around the beautiful Sunshine Coast and the hinterland, just stunning - so don't forget your camera! The 2hr Harley ride up the Blackall Range and the exhilarating ride back down again is a favourite weekend ride for bikers from the Sunshine Coast and Brisbane, and it's easy to see why. A Harley Ride and Country Tea is just what the doctor ordered! Ride through quaint rural villages and enjoy morning or afternoon tea in a country atmosphere. Here's an opportunity to relax, indulge your taste buds, and enjoy the Sunshine Coast on a chauffeur driven Harley-Davidson trike. Now this is a winery tour with style - much more fun than on a bus or in a car. Relax and let the stress of modern day life wash over you. And best of all, you don't even have to worry about getting home. 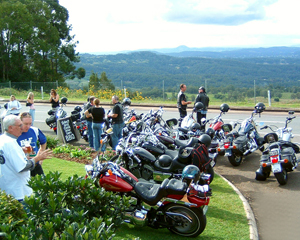 Put some passion into your love life with a romantic Harley Twilight Tour for 2 on the Sunshine Coast. A warm balmy evening, your partner by your side, and a dream ride on a Harley trike through some of the most stunning scenery in Australia. How good is that! During your 15 minute helicopter scenic flight you will enjoy the unspoiled views of the Glasshouse Mountains, then travel over to Montville before heading back along the stunning coastline from Mooloolaba. This is the best way to see the beautiful Sunshine Coast!